Provide comfort for the family of Elizabeth Lumbama with a meaningful gesture of sympathy. 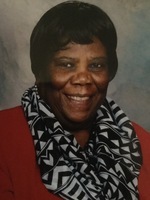 It is with great sorrow that the family of Elizabeth Lusuko Lumbama announce her passing on April 4th, 2019, in Sudbury, Ontario, after a brief illness. Elizabeth was predeceased by her beloved husband, the Reverend Elijah Katema Lumbama, her daughter, Fredah and three grandsons. She will be greatly missed by her brother, Laketi and his family, sons, Chris, Noel, Harrison, Joel and Victor, their wives, 17 grandchildren, and 3 great-grandchildren. Elizabeth was born in Zambia and assisted her husband in his Mission work with the United Church, travelling, and happily performing the duties of a Minister’s wife. After her husband’s retirement in Zambia, they moved back to Canada. Elizabeth was very active with the U.C.W., the United Church Women, at St. Paul’s and St. Peter’s in Sudbury. Her funeral service will be held on Saturday, April 13th at 11:00 a.m., at St. Peter’s United Church, 203 York Street, Sudbury, Ontario, P3E 2A2, 1-705-675-2171. There will be visitation from 9:45 a.m. to 10:45 a.m., prior to the service, and a reception to follow. Mrs. Lumbama wished to be buried beside her beloved husband and family in Zambia. To that end, the family would like to request that in lieu of flowers etc. donations be made to a Go Fund Me account in the name of Elizabeth Lumbama, to send her home to be buried with her loved ones. Thank you. https://www.gofundme.com/elizabeth-lusuko-lumbama Arrangements entrusted to the Lougheed Funeral Home. To send flowers in memory of Elizabeth Lumbama (Lusuko), please visit our Heartfelt Sympathies Store. Consider providing a gift of comfort for the family of Elizabeth Lumbama by sending flowers.